Iron Springs / Horsefly Mesa: This mesa begins on the west side of Dallas Divide. The mesa stretches north to Montrose and west to Norwood. 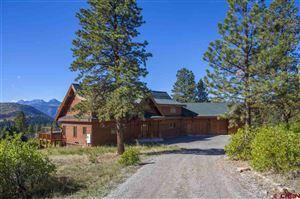 It’s proximity to Telluride and Ridgway makes this area desirable for those looking for seclusion with convenience to recreational activities and modern amenities. Most parcels in this area are 40+ acres and are considered high alpine country. Mostly treed with Aspen, Ponderosa, and Blue Spurce this area is highly diverse in its terrain, wildlife and expansive views. Most of the area has year round access and consists of larger ranches that have been sub-divided over the years creating many upper end developments with parcels ranging into the hundreds of acres. Come have a look at this area and its expansive views. See all Iron Springs/Horsefly Mesa Map Search.